Vivec City is the largest settlement on Vvardenfell, and one of the largest cities in the East. Each of the great cantons is the size of a complete town. The High Fane and the palace of Vivec are visited by hundreds of tourists and pilgrims daily. Citizens flock to the Arena for public entertainments like mock battles and comic plays. Outlanders mostly confine themselves to the Foreign Canton, while natives live, work, and shop in the Great House compounds and residential cantons. But most of all, this is Lord Vivec's holy city. The Ministry of Truth, the Temple prison, hangs above the great temple of the High Fane, the Halls of Wisdom and Justice, and Lord Vivec's Palace. Vivec is a city made up of eight cantons, each a little town in itself. 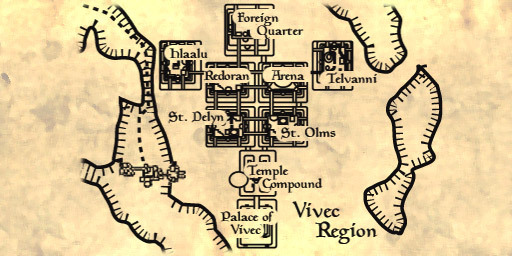 On a map, it looks like a cross, with the Foreign Quarter at the top, the Temple Compound, with Vivec's Palace, the High Fane, the Ministry of Truth, and the Hall of Wisdom and the Hall of Justice at the bottom, the Hlaalu Compound to the west, the Telvanni Compound on the east, and four cantons grouped together at the center of the cross -- Redoran Compound northwest, Arena northeast, St. Delyn's Canton southwest, and St. Olms Canton southeast. The Foreign Quarter is the large three-tiered canton to the north. Originally, foreigners were not allowed to enter Vivec any further than the Foreign Quarter, but now outlanders can travel throughout Vivec at will. The Imperial Guilds each have guildhalls and complete services here, and an Imperial cult shrine serves the spiritual needs of the Imperial faithful. Various independent tradesmen, craftsmen, and trainers also rent space here. The Black Shalk Cornerclub rents beds to non-guild visitors. The High Fane is the largest Tribunal temple on Vvardenfell. Archcanon Saryoni presides over the temple, along with a large staff of priests, healers, and monks. Pilgrims travel from all over Morrowind to view the High Fane and the Ministry of Truth, and to offer prayer and thanks before the Palace of Vivec. The Ministry of Truth, a celestial body suspended by Vivec's mighty power over the Temple Compound, is the headquarters of the Temple Ordinator, and heretics are imprisoned and re-educated there. The Hall of Wisdom and Hall of Justice contain the executive, administrative, judicial, and martial operations of the Tribunal Temple. The Palace of Vivec is the abode of the god-hero Lord Vivec, the Warrior-Poet of the three deities who comprise Almsivi, the divine patrons of the Tribunal Temple. Only the most devout are admitted to the presence of Lord Vivec, and only at his initiation. Beneath the Palace of Vivec is the Puzzle Canal, a place of worship and testing for questing heroes hoping to receive Vivec's favor. Many choice treasures are guarded by Daedric servants in the Puzzle Canal's dark passages. Hlaalu Compound is the westmost canton. The Hlaalu Councilor Crassius Curio has a splendid tier-top mansion here. The tiers below contain Hlaalu treasuries, records, holding cells, and various Great House services. There are two public houses: the Elven Nations and the No Name Club. A variety of craftsmen and tradesmen also have shops at Hlaalu Compound. Some House Hlaalu nobles and retainers prefer to maintain their residences in the less-formal St. Delyn and St. Olms cantons. Telvanni Compound is the eastmost canton. The mage-lord Mavon Drenim is the ranking Telvanni noble. The Telvanni rent the compound from the Temple, and have to make do with a Velothi tower instead of their preferred mushroom towers. The administrative center includes a treasury and a hall of records. Slaves are housed in the lowest tiers, along with cells full of monsters. There are many tradesmen, craftsmen, and trainers, and the Lizard's Head cornerclub provides lodgings for Telvanni kin and mercenaries. Redoran Compound is the canton south of the Foreign Quarter, west of and next to the Arena. The Redoran administrative center there includes the Redoran Treasury, Hall of Records, and Holding Cells. On the lowest tier is a Redoran shrine and ancestral vaults. Two noble families, the Sarens and the Dralors, have top-tier manors. There are many tradesmen, craftsmen, and trainers, and the Flowers of Gold cornerclub provides lodgings for Redoran kin and retainers. The Arena Compound lies between the Redoran compound on the west and the Telvanni compound on the east. The Arena is the site of public entertainments and combat sports. The comfortable domed Arena has seating for hundreds of spectators; beneath the Arena are dressing and storage rooms for entertainers and training rooms and animal pens for the combat competitors. St. Delyn Canton and St. Olms Canton are residence cantons for commoners and paupers. The Temple charges very reasonable rents for comfortable workshops, shops, and apartments, and most of Vvardenfell's crafts and light industry are housed in these cantons. The Abbey of St. Delyn the Wise is on the top tier of St. Delyn, and Hlaalu Councilor Yngling Half-Troll has a top-tier manor on St. Olms. Foot bridges connect with the mainland between the Ebonheart region and Hlaalu Compound, between the north bay region and the Foreign Quarter, and between the east bay region and Telvanni Compound. Good roads lead from the Hlaalu Compound bridge south to Ebonheart and north to Seyda Neen and points north. Good roads lead from the Foreign Quarter bridge west towards Seyda Neen, north towards Suran and the Ascadian Isles, and east towards Molag Mar. Roads from the Telvanni Compound bridge are useful mostly for travelers to Molag Mar. Silt strider service is available at the north end of the Foreign Quarter bridge, traveling from Vivec to Suran, Seyda Neen, Balmora, and Molag Mar. Ships from the docks at the Foreign Quarter travel to Ebonheart, Hla Oad, Molag Mar, and Tel Branora. Ships from nearby Ebonheart sail to Hla Oad, Sadrith Mora, Tel Branora, and the Foreign Quarter of Vivec. Low-fare gondolas shuttle passengers from canton to canton via Vivec's canals.